Anoxia is the absence of oxygen in inspired (inhaled) gases or in arterial blood and/or in the tissues. Anoxia is closely related to hypoxia, which is a severe oxygen deficiency in the tissues. One can think of anoxia as the most extreme case of hypoxia. Ensure workplace safety with confined space products from Safety Emporium. If your body isn't getting oxygen, you die. It's that simple. The same is true for fish that swim in water that is depleted in oxygen. Anoxia usually appears on an SDS as a symptom of inhalation of a substance that interferes with oxygen transport mechanisms in the body, examples being carbon monoxide and hydrogen cyanide. When working with substances like these, special engineering controls such as a fume hood or local exhaust ventilation should be utilized. If these controls are not sufficient, then personal protective equipment such as a supplied air respirator should be utilized. Anoxia can also be caused by entering an oxygen-depleted atmosphere. If your workplace has large storage tanks, sewers, etc, a confined space entry program is required under OSHA regulations. NINDS Cerebral Hypoxia Information Page. 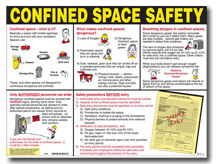 Confined Spaces as well as applicable standards at US OSHA. Anoxic Brain Damage at Caremark Inc.